The battle system, however, is not a typical element. In the game, you bring up your menu, and select battle to go into a turn based battle against the enemies on screen. 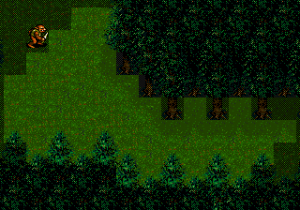 In the battle, you move your character (invisible in this shot due to the blinking) up to the enemy and attack. Position seems to matter when you are doing this. The grey area is outside of the player's range. Like many experimental games, the battle system feels unbalanced (you can barely fight one goblin before needing to flee to heal at the start of the game.) If you don’t grind on the goblins, you can accidentally kill them all before you’re able to handle the next area of enemies. The game does not block you off from enemies that are too strong for you. 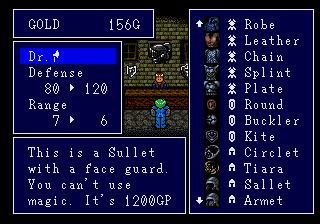 This sullet / sallet typo is an example of an early translation error in the first town. One hallmark of these early games is an awkward translation. 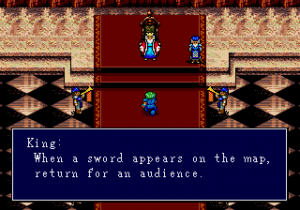 Of course, with deadlines, low budgets, and difficult programming limitations, it’s no wonder that translations are awkward in many older RPGs. For some people, the occasional awkward sentence, mistranslation, and typo can be interesting, and the curtness left by cutting out dialogue for space can be charming. For other people, it’s a frustrating example of things lost in translation. Bumping a character to talk is a typical early RPG method of talking, and Sorcerer's Kingdom uses it. Here, the hero explores the first town. 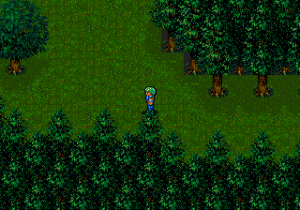 As the game goes, the graphics are awkward but tolerable. 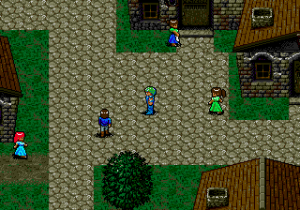 The bright colors and slightly ‘strange’ look to the sprites is actually kind of charming. It feels like a much earlier game, since the art style doesn’t really look typical. The music is pretty good. The battle system is fairly fluid, but the difficulty curve is pretty sharp in the game. On the other hand, you can teleport back to another town at almost any point of your explorations, making death purely due to bad luck in battle or picking the wrong battle. Is the game an obscure classic? I’d probably say no, but I do thing that some people might find a fascinating game despite the flaws. Talking to the king in the introduction of Sorcerer's Kingdom.